BMWC 17 took place from May 7 to May 12, 2013 in a beautiful forested area near Chotěboř. 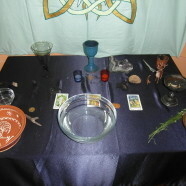 We were again able to welcome all friendly folks interested in paganism, witchcraft, magic, druidry and similar paths. Thanks to a public holiday on May 8, BMWC 18 was one day longer than previous years and the extra day featured an all-day workshop called „Phoenix Rising“ led by Vivianne and Chris Crowley, renowned pagan and occult writers from the United Kingdom. As in the previous years, many rituals, workshops and hikes in the beautiful landscape took place in a friendly and welcoming atmosphere with lots of fun.